I was never a runner growing up. It was boring, repetitive, and worse of all, painful. Why anyone would put themselves through this torture was beyond my understanding. Yet, like other unexplainable decisions we make in life (jumping out of planes, mixing dark and white liquor, starting a 14 page paper the day before it’s due), I signed up for the Bolder Boulder 10k last year. Even though I hadn’t run anything significant in over 8 years, I was playing basketball and lifting weights regularly enough to think I could handle it. I completed the race in 70 minutes and swore off running forever. Even the free beer and goodie bag afterwards couldn’t waver my decision. A couple days later, I felt an unexpected urge - the urge to do it again. My legs felt stronger, my pace of 11 minutes/mile looked beatable. 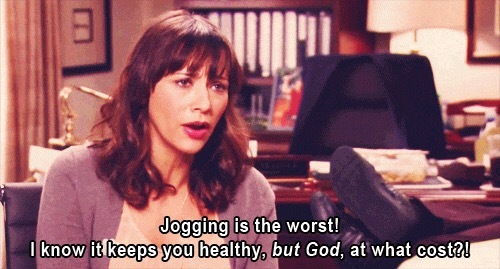 And that’s when I knew I had caught the running bug. It’s strange how something so painful could be so addicting. Each run afterwards, I would try to push myself a little bit faster, or a little bit further. I wasn’t always successful, but failing just motivated me more next time. To me, the appeal of running isn’t about optimal exercise or finishing in the top 10 or feeling good while doing it. It’s about pushing my body and mind beyond its comfort zone. It’s about doing something challenging and at times, seemingly impossible. And it’s about not quitting when I want to the most, and finding a way to fight through the pain. There is nothing pleasant about slamming my feet down in front of each other for 15/30/60 minutes while counting down the seconds until it’s over. But I love the sense of accomplishment I get after every run and the rush that comes when I beat my old time or distance. I’m already looking forward to my next run, though I have a feeling I’m going to really, really hate it. See you on the road.